I hired the Rodeo Bull for 4 hours the other day for my daughters 18th birthday. The level of service was exceptional, the rodeo bull was set up within 10 minutes of the delivery team arriving and the children and adults had a great time with this fantastic product. Thoroughly recommend the low hassle service and great hire prices provided by DJ Land of Castles, Thanks Paul. I will be definitely book again. toy story bouncy castle st-helens. After the incredibly popular Toy Story 3 was released in July 2010 we decided to bring you this bouncy castle. The front pillars feature the two main characters in Buzz and Woody. 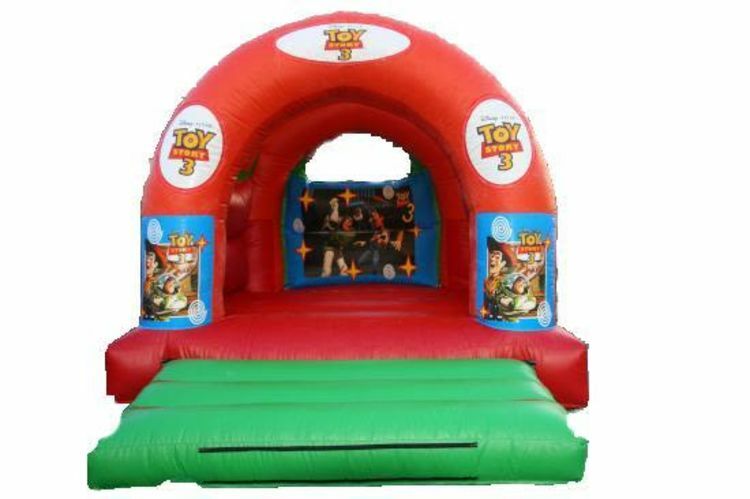 The back wall features all of Andy's toys.This 12ft x 15ft toy story bouncy castles is a great unisex castle and is a very popular choice.This themed bouncy castles has a raincover so whatever the weather you can still have fun on our Toy Story castle.The required space is 16ft long and 13ft wide,the heigh of this bouncy inflatable is 11ft,if you are wnating your castles in a venue make sure the celing height is higher than the castles height.We deliver our themed bouncy castles, inflatable slides,rodeo bull hire,plus are assault courses and adult bouncy castles and domes,to Merseyside & Liverpool, Widnes, Runcorn, Wirral,Warrington, and St Helens, and some of these areas and further areas will be a additional fuel charge or toll/tunnel charge.Check our delivery checker on our home page,it will tell you if there is a charge for your area. This toy story castle holds up to (6/10) 6 years old children in age at one time,Depending on the size of the children.